I love when I get to announce a new pattern, and this is sort of like that :) This is the Apogee pullover. It's my first sweater design ever (but not my first sweater pattern release). This baby and I went through some tough times together, which you probably know all about if you read this blog, lol. I chronicled the entire design process as The Great Design Project (which you can access through the button on my right sidebar. 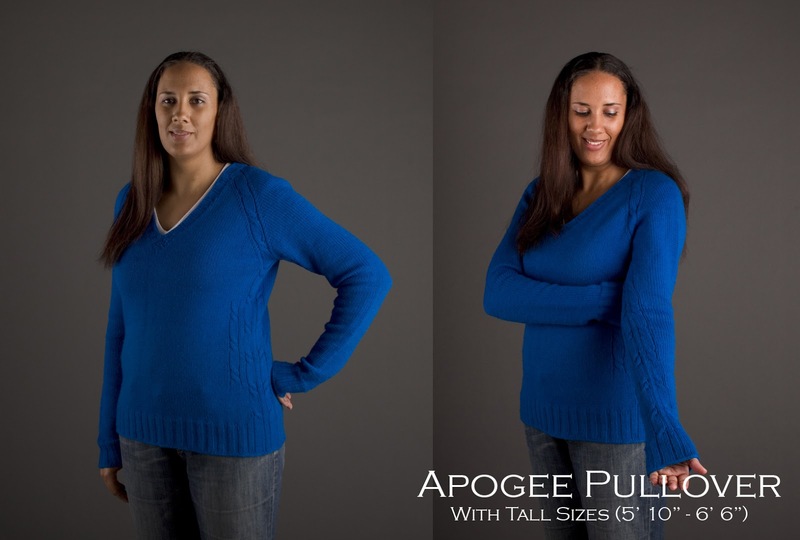 The Apogee Pullover is much like it's sister, the Apogee Cardigan...except it's a pullover... I guess you can see that. This is great for those extra cold days. The type of day when you want to be completely covered in wool and you don't want to take your sweater off (think dead of winter in most of the country and November in the North East, lol). It has the same pretty cable along the raglan, and the same clever use of cables to create waist shaping. It has extra long sleeves, and the pattern provides traditional and tall sizes. I learned so much from this sweater! And it was my intention to be able to release it earlier in the year but things got complicated and that just didn't pan out, but better late than never! I'm releasing the design on November 18th, but it is available for pre-order as of right now! If you pre-order, you will receive the first page of the pattern with all the necessary information to allow you to shop for yarn and needles, and knit your gauge swatch. The full pattern will be uploaded to Ravelry on November 19th, and will automatically update in your pattern library. You'll even get an email from Ravelry telling you that you've got an update, so you don't have to do anything special. And as an extra bonus, you get the pattern for the special price of $5.00. On Nov 19th, the pattern will revert back to the regular price of $6.50. If you think you might want both patterns, don't worry. I'll be putting together an ebook with both patterns and a little price break after the Apogee Pullover is out. So go pre-order your copy now! Hi Cambria, love your new website and blog! I have to say that's a pretty fabulous pullover you've designed, it looks wonderful on you! And the colour, gorgeous. Thanks for stopping by my blog, I've been struggling along trying to learn Fair Isle knitting and that tea cozy was my first try at two handed knitting. It's hard!!!! Well, I'm going to go check out your Ravelry and Etsy shop now. Talk to you soon, you knitting genius. Your Ravens in Snow! OMG!